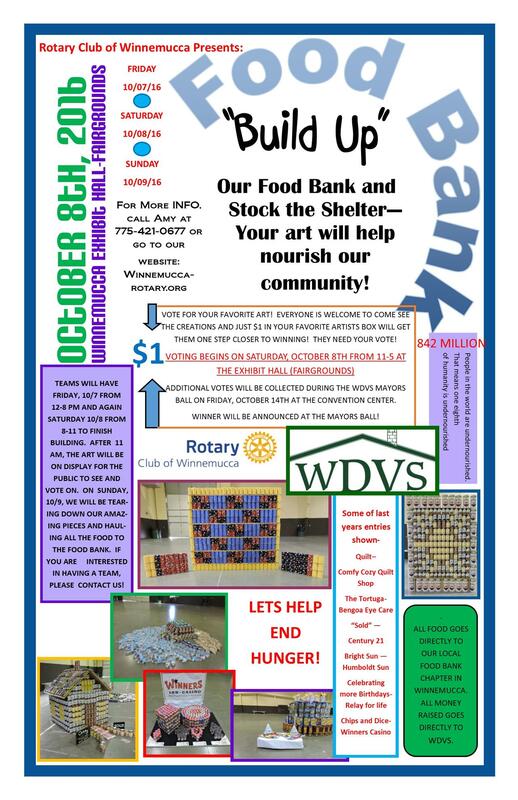 Build a team and compete against others as we help "Build UP our Food Bank and Stock the Shelter"!! This fun event is back for its second year, and we are excited to see your creativity come to life! Teams will be asked to attain their own food items. This can be done by hosting a food drive within your organization, going door to door requesting donations, or by simply purchasing the items you would like to use. Beginning on Friday, October 7th, teams will start assembling their 3D art sculptures made entirely out of food! Each team will have Friday from 12 pm until 8 pm to build in a 10" X 10" area out at the Winnemucca Exhibit Hall (indoors at the Fairgrounds). Then on Saturday, October 8th, teams will finish up with their last minute design tweaks from 8 am until 11 am. At that time, our wonderful panel of judges will be walking the floor, taking notes and scoring each team on a number of factors. The art exhibit opens to the public from 11-5 to "VOTE" on their favorites! Then wrapping up everything on Sunday, October 9th, teams and a number of volunteers will meet back at the Exhibit Hall to disassemble the sculptures, transport food to the food bank and get our official "pounds" recorded. Last year, it was an astonishing number! But that's not all! The following Friday, October 14th, we will be setting up picture boards and the original ballot boxes for additional "VOTING" at the Winnemucca Domestic Violence Shelter "Mayor's Ball". The Mayors Ball is a semi-formal dinner and dancing event that benefits the Shelter and the programs and people they help. Rotary Club will be on-hand all night collecting votes (remember, voting is done with dollars), announcing winners and handing out the prestigious trophies. All of the food collected during this event will be donated to the Winnemucca Branch of the Northern Nevada Food Bank. All monies collected during this event will be used to purchase "New Home Packages" for victims of domestic violence who are transitioning from the shelter back into a home of their own. These packages will include a vacuum cleaner, a new set of dishes, pots and pans and a few other things such as cleaners that are so desperately needed when someone is starting a fresh, new life. What an amazing opportunity this is to help two different non-profit organizations in our community. Put your "building" thinking caps on, form a team and come help us end hunger! Register online today! The registration form and rules are uploaded to the event right here on our website!